Nahum portrays the downfall of Nineveh and Assyria as an image of how God will confront and bring down all violent human empires. The book of Nahum is a collection of poems announcing the downfall of Assyria, one of Israel's worst oppressors. Referencing Daniel, Exodus, Isaiah and Babylon, Nahum shows us that the destruction of Nineveh and Assyria are examples of how God works in history in every age. The book of Nahum opens with God's words from Exodus 34. God is slow to anger and great in power, but He must punish evil. Referencing Isaiah, Nahum reminds the people that when God brings down the arrogant empires He will provide refuge for those who humble themselves before Him. Babylonian soldiers and chariots will attack Nineveh. Chaos reigns as the soldiers breach the city walls, slaughter the people and plunder and destroy the city. Nineveh's downfall causes the Assyrian empire to fall. 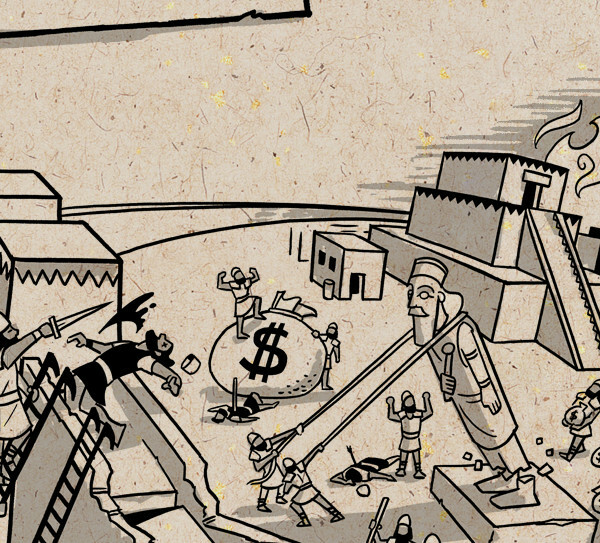 While injustice built the system that made Assyria successful, its violence will also bring about its destruction. Stricken with a fatal wound, the perpetually cruel king of Assyria is taunted and his death is celebrated by the people whom he once oppressed. He is committed to justice and will not allow any arrogant, violent or evil nation to endure forever. However, while He defeats evil, He is also good and cares for the innocent. He will provide a refuge on the day of distress for anyone who humbles himself before God, believes in God's justice and trusts that in His time He will bring down oppressors in every time and place. The book of Habakkuk offers hope to people living in an evil world. It recognizes how dark and chaotic the world is and invites us to trust that God will one day deal with evil because He loves us.